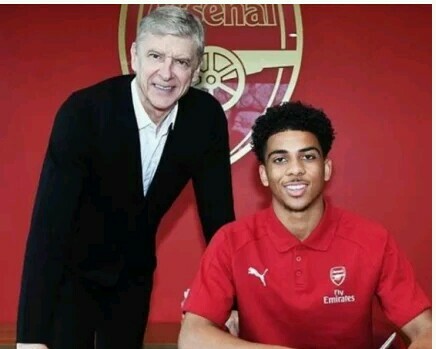 Nigeria-born winger Xavier Amaechi celebrated his 17th birthday in the best possible way with a deal that ties him down at the Emirates Stadium. The youngster who joined the north London club in August 2013, at the age of 12, progressed to become a key figure in the club’s youth setup. Amaechi has scored five goals in four appearances for the Gunners’ U-18 side this campaign. The contract came as a reward for the left-footed winger who has also featured for the U23 side in Premier League 2 this term. And he is on course to follow in the steps of Nigeria international Alex Iwobi and Chuba Akpom both of whom have progressed to the Gunners’ first-team fold. “Talented winger Xavier Amaechi has signed his first professional contract with the club. Xavier, who turned 17 today, has featured for both our under-23s and under-18s this season. He has been at the club since the age of 12, having joined us in August 2013. We would like to congratulate Xavier on his new contract and look forward to his continued progress at the club” a statement read on the club website.